Durable, sleek and eco-friendly, the Women's Guard TYReco Diamondfit Workout Bikini is a triple threat. Our one-of-a-kind TYReco textile, constructed from recycled fabric, requires less energy to produce, creating a lower level of CO2 pollution. Featuring a moderate coverage top and bottom, sleek/flexible straps and adjustable drawcord waist, our Diamondfit bikinis are built for athletes who want reliable coverage during every swim. 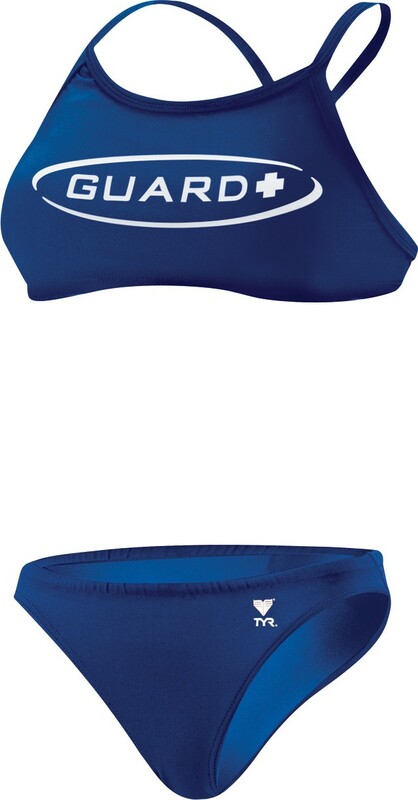 With an oversized guard logo for rapid identification, the BGUR1A is ideal for both pool and beach use. In addition to providing a long-lasting fit, UPF 50+ protection and chlorine resistance, this fully lined workout bikini is offered in multiple color options. Great fit and is holding up well to all the sand. Q: Does this, or any of the tops come with removable padding? A: Thank you for your inquiry. Unfortunately this suit does not have padding. I have provided a link below for our suits that have removable padding.